We hereby invite you cordially for the 15th edition of Thailand Open. Also for 2019 we have tried to put together a very attractive program for you. You can see for yourself what you want to participate in. For example, you can only choose for the tournament, or only Dubai and the tournament in Thailand, or Dubai, Thailand Open and Bangkok. We expect a lot of native Thai draughtsplayers again next year. Checkers on the International board are now starting to get their feet firmly established in Thailand and that will only make the tournament more fun. In addition to the Thai participants, we also expect a lot of draughtsplayers from various Asian countries and of course also from the Netherlands. The registration fee is € 55. The tournament will again be lost in the beautiful Splendid resort! Stay in this hotel, as in the 2018 edition, will be € 22.50 pp including breakfast buffet and based on a shared double room. For players who do not stay in the player hotel or do not book through the organization there is a surcharge of € 30 euro. The latter is necessary in order to be able to keep e.e.a. affordable. If, like this year, we do not have enough rooms in our player hotel, the hotel will no longer be able to sponsor our tournament, which would mean the end of Thailand Open. Nevertheless, we try to row with the belts we have, and look forward to an undoubtedly exciting, fun and fun edition of Thailand Open! Registration is very simple. Sending an email to tjonaong@gmail.com is sufficient or a message to 06-33667244 Andrew Tjon A Ong. Everything can be arranged for you: from flight ticket and hotel reservation to transfers, the Dubai tour or the Vietnamtour. The tournament counts eight rounds according to the Swiss system, with a playing speed of 80 minutes plus 1 minute per move. The tournament has been recognized by the FMJD and according to FMJD regulations will be played. Rating, standards and titles will also be achieved. Also this year we will have a very full prize pool. It will depend further on the number of participants, but in recent years we had around € 2000 in cash and in addition each round three round prizes, so that it will be interesting for both the world topplayers and the beginners. Everyone is welcome! The tournament is now finished earlier, but then we have two more tournaments on the program, the Rapid and Blitz Championships. That is specially programmed so that for the Thai draughtsplayers, who can not take many days off for the main tournament, but would like to measure their strength with other players from other countries, they can easily participate in these tournaments. This year again, we willl also host the WorldCup Rapid and Blitz in Draughts 64. These WorldCup tournaments are easy to combine with the Thailand Open draughts 100 tournament. We have more events on our program of Thailand Open 2019. If you want to join the 15th Thailand Open, and you have some more time, then you can also join our Dubai Roundtrip! Everyone can join this beautiful stop-overtour! Day 01, Friday, May, 24 Arrival in DUBAI. After arrival in Dubai, Our guide Siraj will welcome us, and he and his driver will bring us to our hotel. We will stay in a comfortable hotel in the centre of Dubaicity. During the day you have free to acclimatize. You can already explore the city or go shopping in the souks or major Malls in Dubai. At about 19:00hrs you will be picked up for a Dhow Cruise (buffet & incl.diner non alc. Beverages) This romantic excursion sail by moonlight on the Dubai Creek. During this cruise with a traditional Arabic wooden ship, has an enchanting view of the Dubai skyline while enjoying a delicious dinner. The character of the city is an entanglement of modern and traditional. You'll see luxury yachts. Beautiful examples of architecture like the Dubai Creek Golf & Yacht Club and the spectacular building of the Chamber of Commerce can not pass your sight. But the old wooden dhows, the residence of Sheikh Saeed and the Heritage Village remind you of the past. Dinner and fragrant Arabic coffee are included in this excursion. This fascinating tour takes you to Dubai City and Palm Islands. Visit to the Goldsoukh, the Mall of Dubai, to see the world's tallest building, the Burj Khalifa, Then we go to the Jumeirah open beach, where we include the most expensive hotel in the world Burj Al Arab view and then we visit the famous Palm Islands. Day 04, Monday, May 27, DUBAI Day at leisure! -Dubai has many attractions to see and experience. It is difficult to make everyone happy. One can stroll through the city's nicest, another wants to go shopping in the souks or the gigantic shopping malls visits, while another prefers to beautiful white beach is (Jumeira Open Beach). That is why this day is left open so that everyone can fill it to your own taste. There are a variety of ready-made excursions, which can be made. A must is the Desert Safari. A must for the Dubai Eye, but we did this excursion is not included in the regular program, because it is not suitable for heart patients and people with neck and back pain. It can get pretty wild to draw near! This excursion begins somewhat later in the afternoon and in the evening you will then, after dinner under the stars, back to the hotel. - In this tour you will get a good picture of Abu Dhabi, an emirate of Dubai seems that strong but yet so different. From Dubai Travel along the world's largest man-made harbor at Jebel Ali. During the two hour drive to Abu Dhabi you will pass through desert landscapes covered with acacia trees. Abu Dhabi is the capital of the United Arab Emirates and has many striking examples of modern architecture. They show intriguing interpretations of Islamic themes, set in contemporary materials. During the route along the Corniche with the clear blue Gulf waters and enticing islands along the coast, you will see glittering skyscrapers and other buildings. In the city of Abu Dhabi with its impressive contrasts, visit the Abu Dhabi outdoor museum, largest shopping mall in Abu Dhabi and the Seikh Zayed Mosque which is certainly worth a visit. -Today you can get your last minute shopping and see what things you want to see again or not yet seen. In the evening transfer to the airport. 6 day Dubai / Abu-Dhabi travel for only 335, - Euro! - A magical evening in the desert. You depart from your hotel in the afternoon for an exciting journey through the vast red dunes of Murgham for unforgettable safari tour. Then you can enjoy the beautiful sunset in the endless desert. After the journey feather to the Bedouin camp. After a camel ride you will enjoy a delicious barbecue with Arabic specialties. The tour ends with traditional Arabic entertainment: a belly dancer dancing to the rhythm of Arabic music. Upon return Dubai remains for sufficient time to enjoy the nightlife of Dubai. This tour is not suitable for heart patients and people with neck and back pain. - A High Tea in the impressive seven star hotel Burj Al Arab may actually not be missing in your trip to Dubai. The Burj Al Arab is the symbol of Dubai, known for its special shape. When you enter the hotel you will see a stunning atrium, the highest atrium in the world. The interior is inspiring and consists of many golden accents. -This souk, near the Burj al Arab, is a nice place to shop and eat. It is built in a beautiful style and you can buy many different things. Have a delicious dinner at one of the many restaurants and enjoy the Burj al Arab. Everyone can register for this trip! One of the highlights of this year's Thailand Open events is undoubtedly the unique trip to the unspoilt part of North Vietnam. This trip has been composed with great care and attention and fits in seamlessly with the Thailand Open tournament. We have compiled this trip ourselves and you can not book anywhere else in the world. We visit places that the ordinary tourist will never see and visit mountain peoples who have hardly ever seen tourists before. That makes this trip extremely interesting and a must for nature and culture lovers. After we have finished our expedition in the mountains of North Vietnam we travel to the natural wonder of Halong Bay, where we will make a two day cruise and the last days we will relax on an island off the coast of Vietnam. Morning: Our tour guide will meet and greet you at the airport, then transfer to hotel in Hanoi for checking in. Have lunch with special foods of Bun Cha. Afternoon free. Evening: Have welcomedinner at local restaurant & overnight in hotel. Have breakfast, then transfer to enjoy city day tour, Enjoy sightseeing tour to visit the city’s landmarks such as Ho Chi Minh Mausoleum, One Pillar Pagoda, The Temple of Literature (First University built in the 11 Century). Have lunch with special foods of Bun Cha. Afternoon, visit Hanoi Hilton Museum. Hanoi old qaurter, Ngoc son temple and Enjoy 1 hour cyclo tour around the Hanoi City’s old quarters and the traditional water puppetry show. Have dinner at local restaurant & overnight in hotel. Have breakfast, then take the bus going to Sapa with 6 hours of journey, Sapa is an elevation of 1, 500 meters, Sapa is the former hill retreat for French administrators when the heat in plain became unbearable. 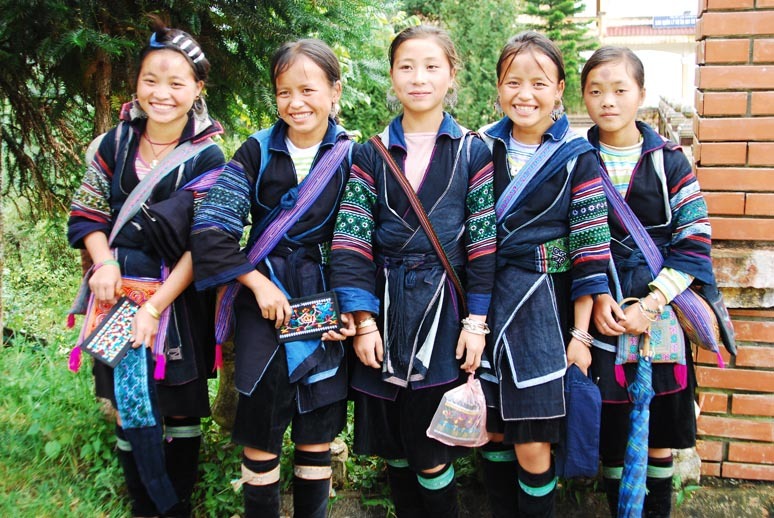 The remoteness and simple lifestyle of ethnic minorities are a highlight of Hoang Lien mountain. Have lunch en-route, upon arrive Sapa – check in hotel & Have dinner & overnight in Sapa. Have breakfast, then enjoy to visit terraces in this morning, bus pick up, then transfer to trekking point to visit Lao Chai and Ta Van villages inhabited by Black H’mong and Dzay ethnic minorities. Have lunch in the village. Enjoy amazing and breath-taking landscapes of terraced paddies, green valleys and meet with friendly local people. Back to the hotel and free at leisure. In the afternoon, return to hotel for free at leisure. Have dinner & overnight in hotel. Have breakfast, then taking bus trip to Ha Giang, en-route stopover for visiting Chang village, inhabited by Tay minority people. Enjoy beautiful scenery of the mountainous area, featured with palm tree hills. Have lunch en-route, upon arrive Ha Giang, check in hotel in Ha Giang City, have dinner & overnight in resort. Have breakfast, then keep going Dong Van, a series of long passes and deep valleys. We then cross a landscape of pine forest and arrive at the astonishing King of the H’mong’s Palace, a fortress built by a local chief allied with the French against the Viet Minh, Vuong Chin Duc, and evacuated in 1950 (his descendants now live in France and Canada). Have lunch enroute, take the beautiful picture of terrace & mountain at Ma Phi Leng pass. Transfer to Yen Minh for checking hotel. Dinner & Overnight in hotel. Have breakfast, then start to drive through the rolling hills and the picturesque scenery to Ba Be National Park. The roads are very bumpy and zigzagging however we will have a chance to meet the Hmong, Dao, Tay and Nung ethnic minorities who make for the main population of this region. We are sure to attract their attention as this part of the country receive very few visitors. Depending on road and traffic conditions we arrive in Ba Be by late afternoon or early evening, but it is till an interesting day. Dinner & overnight at homestay or hotel (opt). The legendary lake of Ba Be is just one continuous water body although the name means" three lakes". Today we embark on a boat cruising down the lake which is the main water source of the lake. This exciting river trip will give us a taste of the tranquil countryside and an enjoyable exploration of the Ba Be Lake, Puong cave & Dau Dang Waterfalls. Have lunch at local restaurant and afternoon drive to Caobang. Have dinner & Overnight at hotel in Caobang. Have breakfast, then depart Cao Bang to Ban Gioc Waterfall (Trung Khanh) and enjoy the very nice scenery with water reeling handmade by the Tay & Nung People, which brings water from the stream to the rice fields. Peaceful feeling will let you comfortable. Short trek to visit Ngam Ngao Cave, a big and yet unexplored cave with extraordinary natural stalactites (please wear appropriate shoes and shorts, since you most likely will get wet). Continue to Ban Gioc Waterfall, which shares the river border with China. Take a boat trip to the waterfall, where you will meet visitors from China, who also come here to enjoy the atmosphere of the famous waterfall on the same river. Boxed lunch will be provided. Afternoon drive to Lang Son - Bac Giang. Have dinner & overnight at hotel in Bac Giang. Drive to Halong bay through the lush of Red River vegetation. Arrival Halong bay pier and check-in registration, board our boat for a stunning cruise amongst towering limestone backdrop while enjoying lunch on board. The cruise will take you by exotic islets with shapes of Dog, Sail,… which are naturally formed by process of erosion between the see water and limestone mountains. Arrive Surprise Cave a a visit and then explore Luon cave by bamboo a row sampan, this cave is a natural tunnel thrusts through a mountain's foot and leads to an exotic lagoon surrounded by mountains covered by dense jungle. Seafood dinner and optional night paddle. Overnight on Halong Cruise (twin A.C cabin). A new day wake you up with joys and emotions in an early morning for watching sunrise on sea. Enjoy breakfast and continue exploration. Visit Tortoise, Man's head islands. Brunch on board before returning to the wharf. Disembark, transfer to Tuan Chau island. Upon arrive, check in hotel. Dinner by your own & overnight in hotel. Have breakfast, free at leisure in the beach, lunch & dinner by your own. Overnight in resort. Have breakfast, enjoy free at leisure, lunch & dinner by your own until transfer back to Noibai airport for the flight departure back to Thailand. Your passport must be valid for a minimum of six months after departure from Vietnam. You need: Application Form (provided by the organization), passport and 1 passport photo. The single supplement is € 170 for solo travelers who want a single hotel room. In 2011 we had a tour of South Vietnam and in 2015 the tour of Central North Vietnam and now it is the unknown part of North Vietnam's turn. This area is known for the beautiful nature and the exotic mountain tribes and peoples. Therefore this trip is an extra recommendation for nature lovers and those who want to get to know exotic cultures. We also make an unforgettable two-day Deluxe Cruise in Halong Bay, which is not for nothing one of the seven Nature world wonders! Have you ever wanted to go to Vietnam, then you must definitely experience this trip. You do not have to leave it for the price. It took a while to negotiate for this trip, but because we probably get the minimum number of people of 22, we get this trip for an absolute bottom price !! To maximize the comfort during the journey, as much as possible has already been booked in advance. Especially with meals we get them at a lower price, if the Vietnamese tour operator books it themselves, than if we had to pay individually at each meal. Now we can pay the total amount immediately at the beginning of the tour, together with all entrance fees. All this ensures more comfort during the trip! Two months to go before the Thailand Open events of 2019 will begin. The first group of just under 20 people will leave for Dubai on 24 May. Then the journey will be continued on May 29 to Thailand, where the 15th Thailand Open will start on Friday May 31. There are no fewer than 5 tournaments on the program until June 9: The regular Thailand Open, with Normal, Blitz and Rapid tournament and also two WordCup tournaments in the draughts-64 (64-field) draughts, Blitz and Rapid. Immediately afterwards, on Sunday 9 June a group of about 20 people will experience the round trip to North Vietnam, till 21 June 2019. You can still register for all events! An email to tjonaong@gmail.com is sufficient. Everything will be further prepared for you. Below the provisional list of participants of the regular Thailand Open tournament. Most Thai participants are not there yet, and a delegation from China and Yakutsk is expected.